Probably pointless to write a TR here but I'll toss up a quick one. Decided to do one more day trip to Acadia before it opens. One to finally see in sort of winter wonderland mode, and basically have the trails to myself. 2 mountains, Dorr and Cadillac. Lots and lots of trails. Great Meadow Loop, Jesup Path, Wild Garden Path, Kane Path, Canon Brook, Dorr South Ridge,Schiff Path, (not sure about that one) Gorge Path, Cadillac North Ridge, and Kebo Brook. Think that's it. Long story short, spikes most of the day, Average post-hole, 4-5"'s. Because of the terrain, it would have been tricky with snows but I went in up to the hip several times in the gorge between Dorr and Cadillac. Switched to crampons there. Lets just say, an interesting .6 miles. The day came in at around 10 miles and 2000' of gain. On the road at 4 AM, home at 8:15. 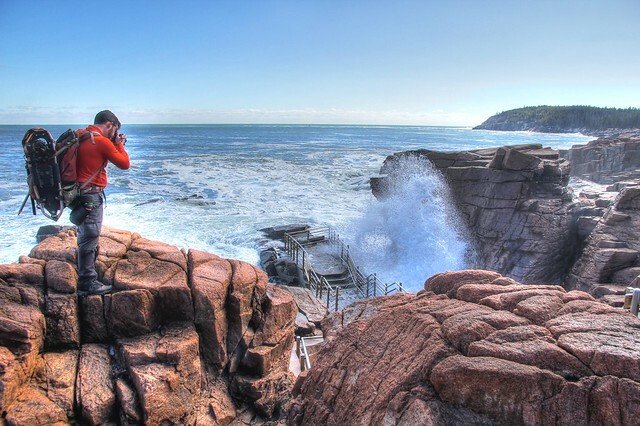 Nothing negative about a trip to Acadia. That gorge path must have collected​ all the snow blown off the ridge. Quite a cool trail. The most "wilderness" like in the park that I've seen. 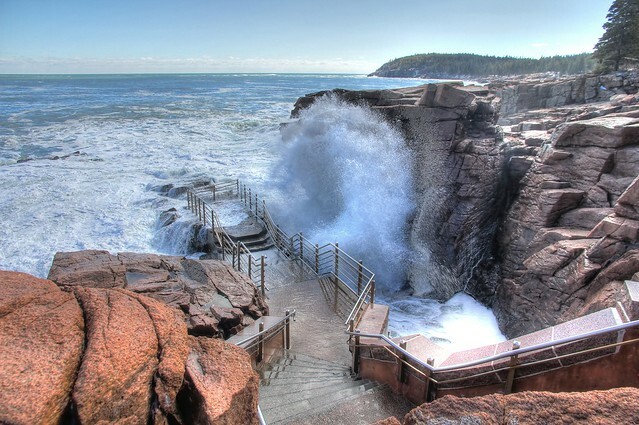 What way did you take going up to Acadia? Through China? Sadly I'm not sure if it's worth posting reports anymore either. I have a few backlogged, maybe I'll try and get a few up. I also tried to respond from my phone and just kept getting error messages earlier. If the site isn't iphone/mobile friendly it's pretty much useless to me. Anyhow great loop there. I guess I'll race you to be the first "winter" finisher on record. Peter and I were just up there Thursday and now you and another forumite also. Maybe we need to change this to Hike-ME! Love that "Smiling Joe with the Cool Shades" shot! What way did you take going up to Acadia? Through China? If you are referring to length of time it's simple. My average drive time is 4 hours. Got to the visitors center at 8. Geared up there, and also planned my hike. Then, went and did the sort shore drive. 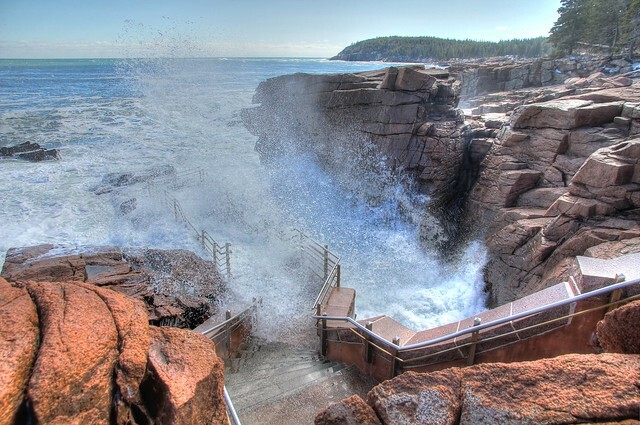 Damned if I can't see Thunder Hole Thundering. Then went to trail-head. Started hike around 9. Slow going do to the 4-5 inches of breakable crust, plus the deep pocket in the gorge. That .6 miles took twice as long as it should have. Had to be really careful. In the car at 4 PM. Home at 8:15 after a gas and food stop. I actually thought I did good on time. I guess I'll race you to be the first "winter" finisher on record. Maybe we need to change this to Hike-ME! You can call it Hike-Whatever. No one will be reading. Whoops. I mean to ask you what route you took to get to Acadia. The pike to rt3 or the pike to 1a. China, Maine & China Lakes is the name of the town/region you go through on the Augusta-Ellsworth route. 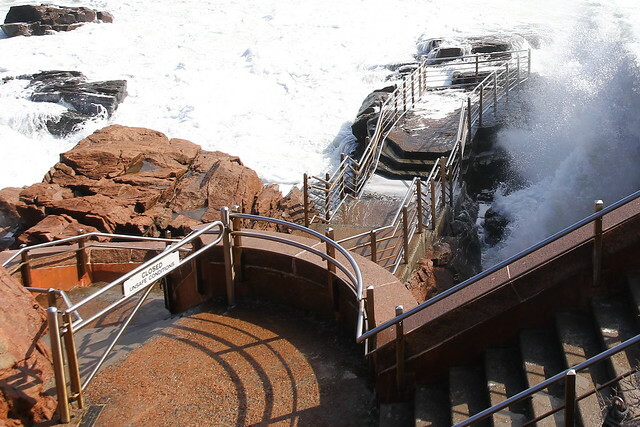 I guess you were just a little late for Thunder Hole. Thursday was as good as I've seen it. Interesting, I don't remember any China signage. But yes, took exit 113 on the way there. And of course, I got stuck behind a milk tanker for 20 miles. I'm calling fowl on the Thunder Hole pics. I think you illegally crossed a barrier to get those shots. They didn't have the rocks cordoned off. The lower part was gated and locked. Upper part was open, and I'd assume the rocks are always use at your own risk. I still read. Other then Potash, a winter Acadia trip of our own, we've only done little local stuff lately. It's lovely to see what people are doing.